Bishop Frederick Calhoun James was born on April 7, 1922 in Prosperity, South Carolina, the son of Edward and Rosa Lee James. He graduated from Drayton Street High School, Newberry, South Carolina. He graduated from Bettis Junior College with an Associate of Arts Degree and earned his B.A. degree in History/English from Allen University (1943), and his Master of Divinity degree from Howard University School of Religion (1947). He also studied at Union Theological Seminary in New York. He married Theressa Gregg, December 30, 1944. As a champion for civil rights, he became a community and state social and political action leader. In 1960, he was elected Consultant/Director of Social Action of the African Methodist Episcopal Church. In this position, he formed a close relationship with Dr. Martin Luther King, Jr. In 1963, he became President of the Effective Sumter Movement of Sumter, South Carolina, a historic chapter in civil rights. In 1967, as pastor of Mt. Pisgah A.M.E. Church, Rev. James led the sponsorship of the first 221(d) Rent Supplement Housing Project in South Carolina. In 1969, he initiated the first 221(h) Home Ownership Project in the state. He was South Carolina’s first African American Congressional District member of the Department of Alcohol and Drug Abuse and the Department of Social Services. 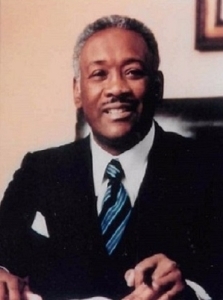 He was the first African American to serve on the Board of Directors at NBSC (National Bank of South Carolina), now SYNOVUS, the first African American member of the Greater Sumter Chamber of Commerce and the first A. M. E. Bishop elected from a South Carolina A. M. E. Church pulpit. From 1987 to 1992 he was a member of the Columbia Housing Authority and served as vice chair. He also served as Vice President of the S. C. Christian Action Council. In 1972, he was elected to the AME Bishopric and was assigned as the Presiding Bishop of the AME Church in South Africa, Lesotho, Botswana, Swaziland, Namibia, and Mozambique. Headquartered in Cape Town, South Africa, he established schools, a publishing house, churches, and other institutions. Bishop James later was assigned bishop in Arkansas and Oklahoma (1976). He formed a lifelong friendship with then Attorney Bill Clinton. In 1984, he was assigned to the 7th Episcopal District, State of South Carolina. In each of these positions, he built housing projects, strengthened schools and led two colleges to full accreditation; Shorter College, N. Little Rock, Arkansas in 1981 and Allen University, Columbia, South Carolina in 1992. In 1992, Bishop James was assigned Ecumenical Bishop and Chaplaincy Endorsement Officer of the African Methodist Episcopal Church International. In 1993, he was given major fiscal and reconciliation duties as Bishop of the Second Episcopal District (Maryland, Washington, D.C., Virginia, and North Carolina) of the African Methodist Episcopal Church and he stabilized the District. In 1994, he was selected by President Clinton as an official member of the delegation to attend the inauguration of South African President Nelson Mandela, and in 1998 he was again chosen to accompany President and Mrs. Clinton on an official visit to South Africa. He retired from active duty in 1996 and he and Dr. Theressa Gregg James, Episcopal Supervisor, retired, returned to live at their home in Columbia, South Carolina. The Rev William Charles Legolie, II and Mrs Leatricia Legolie celebrated their 40th Wedding Anniversary on March 24, 2019. Rev WC Legolie and his wife are the pastoral couple of St Matthew AME Church, 503 Richard Allen Street, Eureka Estate in Cape Town, South Africa.